This series of 2 workshop manuals is the most comprehensive manual available for repairing, restoring and maintaining your Datsun 620. The information in these Workshop Repair Manuals is suitable for the all Datsun 620 Pickup models. 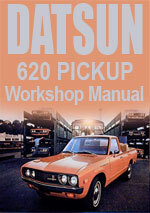 Datsun 620 Series Pick Up Workshop Service Repair Manual $5.99 Immediate Download!